At the library we have a variety of books that you can check out but thats not all we have. At the library you can also look at our for sale shelves and our free shelf for books to add to your own collection. This courtesy service is to help you borrow items from other libraries. Please be responsible and return materials on time. $1.00 per day when overdue. Unable to renew borrowed materials. Internet Access with Printing: A valid Ray County Library card and a signed Internet Usage Agreement are required prior to accessing the internet. An individual may log-in for a one-hour Internet session which may be extended to three hours if computers are available. (Restrictions apply to those less than 18 years of age.) Computers will shut down a quarter till closing. Printing costs are $0.20 per page in black and white, $0.50 per page for color. Copying Machine: A copier is located at the front desk. Black and white copies are $0.20 per page. Color copies are $0.50 per page. Oversized copies are available for an additional fee. Printing: You can use the library computer to print. We currently do not have wireless printing. Faxing: ​ Faxing fees are $0.50 per page when receiving a fax and $1.00 per page for sending a fax. 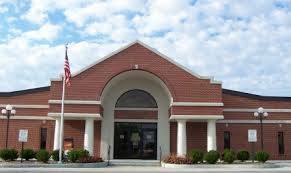 The library’s fax number is 816-776-5103. ​ Scanner: Items can be scanned at the library at no charge. Microfilm Reader: A digital microfilm scanner is located in the Genealogy Room. Genealogy: We have a genealogy room availble to patrons at the library. There are multiple options when getting a library card. Please go to our Get a Card page to see all of the options. For more information on local resources including; The Ray County Museum, Ray County Services for Seniors, Ray County Website, Ray County Court Records Directory, City Chamber Information, City Information, and Local Newspaper Information, click here.